I'm late, I'm late ... yes, I should have posted my Waltzingmouse Christmas Card Challenge card on the 10th of this month. I did have a card I made to post on that day, but I just did not like it and I couldn't bring myself to show it in public. Charmaine Stack of Tweed Curtain is clearly the glitter queen! Really, she is. You can see her card here. Me, not so much. So I tossed my card and made a new one this past weekend. So what does a girl do when the challenge is glitter and she just has no talent for it? Glitter tape! I love this stuff! Glitter without getting it everywhere. So I whipped up a quick, but elegant (I think) set of Christmas cards using my current favorite white base. I love the added touch of the little gold pearls. 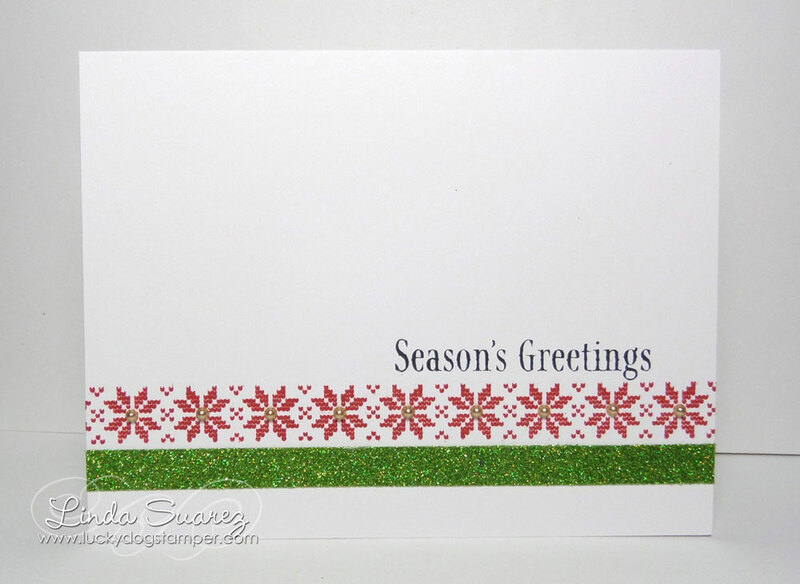 Super simple, yet very festive and still very mailable. I may make a lot more of these. 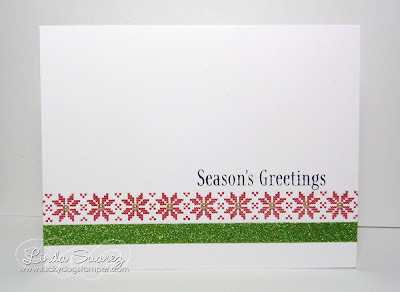 If you love Christmas and Waltzingmouse stamps like I do, you need to join us every month! It's a great way to get a head start on making your Christmas cards! A new challenge will be issued on the 10th of each month in the Waltzingmouse Christmas Card Challenges Forum. If you're not already a forum member, it's easy and free to sign up. The guidelines are also posted in the forum - right here.